Here will find how the new tool are developed. Please feel free to add suggestions and comments. 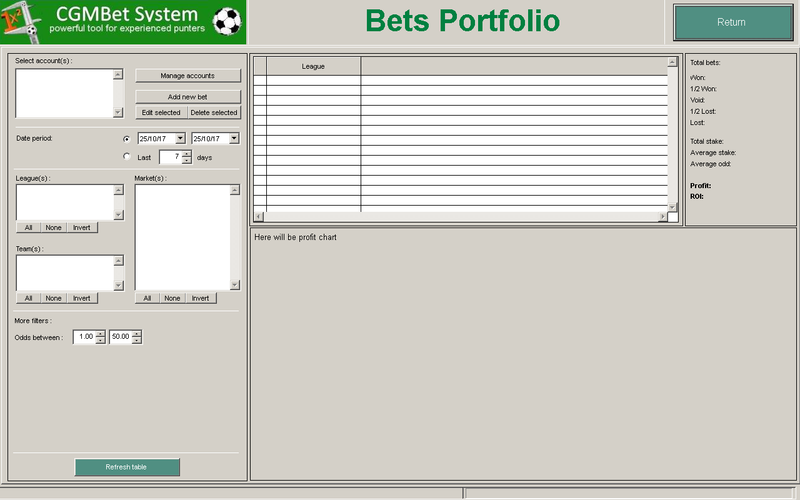 What it is about: My intention is to create a new useful tool that will help you to keep track of your bets. Will be used stand-alone or integrated in CGMBet System. Of course will be integraded into software and the games will be selected from database. Here you may see how the new project is developed. Also I expect suggestions and advices. My intention is to be at full capability until 1st of December but will be good to use earlier for sure. The only dark side is that can not be absolutely free. The good news, only for VIP users, is that, like on any other projects, will be an extremely good discount for early order until 15th of November. After the full release the price will be much higher of course. For only 9 Eur this new tool will be visible on your CGMBet System package. If you do not need it, no problems for you. The software will run perfectly without this add-on. Again, please be aware: the new project will be available on 1st of December but you will see day by day how is developed (by clicking on software button) and may add suggestions on my forum! What I have done so far: many controls are unfished and incompleted but I just want to see how is built day by day. Suggestions and comments are welcome. It sounds like a great project for a daily punter like myself. It would be good to capture my bets without having to do this manually in in excel. I will keep a close eye on this thread and give some suggestions. Looks like a promising project. The thing is that I export all the data outside of CGMBet to select my bets, because I can't make the selections I like in CGMBet. (for example, I would like to calculate different Advanced rating Maker values at ones for the same match). So in long run when I can do my selection in CGMBet it would be a great addon. Good idea. As Scherzzo says most of us do this now manually in Excel or some other spreadsheet program. So possibility to impost past selections would be very important. Also important would be the ease of adding a selections. Something like right click and add to bet tracker. If needed to do manually it's the same trouble as with Excel. Will try to do my best. This week-end will work only on this and hope will see some improvements by Sunday. Also expect other suggestions. Here are some personal suggestions for the tool, guys let me know what you think. 1. Remove the area for the profit chart and expand the view list of games so we can see a bigger list. Instead have a button which shows the profit chart. 2. Move the 'Total bets' section to the left hand side with the other data. 3. Shows odds for when bet was placed and the odds when the market closed. Looks good and will be a useful addition, i use backing and laying for my betting will there be an option to record lay bets. Yes, I have just added few markets for testing. Will be much more. But Backing home team is not Home team win actually? and Laying x2 ? 3. Interesting but will complicate the program because will take a little bit to calculate. I would go even further to see the biggest odds possible to see what and how much we lost..... Will do that after all work. 4. Interesting will think about. Tell me what you think about the leagues, teams, bets selections. Is it easy, intuitive...etc?